To build the PayPal checkout ordering system, you have to create the following tables. Social login user table has been present in the previous article. Product table contains all the product details. You can extend this table based on your needs. Order table contains all the user order details with PayPal payment ids. Let continue the provious article. Here the user session storage data is present, storing the data with setState. Using user id and token you can access other informaiton like products and order details. You have to create common components for multiple uses. In this project, we are commonly using project title and log out. This component contains project Title and log out functionality. Using the props you can disturbute the data. You can import this component in multiple pages. Component for displaying all of the product details. Here the product data is calling from React props constuctor. onClick button this.props.checkOut points to parent function, you will find this in next step. Imported Title and ProductList components with PostData URL fetch provider. Function getProducts() fetch the data from products API based on the login user id and token. Function checkOut() changes the this.state.pid value base on the product value attribute. In the render method, if the pid value is present, it is redirecting to /checkout page. You have to install PayPal checkout component for connecting PayPal API. Install PayPal Express Checkout plugin for React. Create a custom component with Paypal Express Button plugin. You have to configure your PayPal sandbox and production merchent IDs for more inform check PayPal Express Checkout with PHP and MySQL. On payment success, it will call onSuccess with createOther method. This PHP API will validate with payment data like payerID, paymentToken etc.. Valid call changes the redirect state value to true and it redirects to orders page. production: "<insert production client id>"
For production you can change the let evn value to "production". Use my sandbox token for testing. Checkout page for displying more details about the selected product. Imported PayPal component and set attributes values like product value, pid and userData. Orders page this contains all of your successful orders. Function getOrders fetch orders form RESTful apis, component OrdersList renders based on the state.orders array. 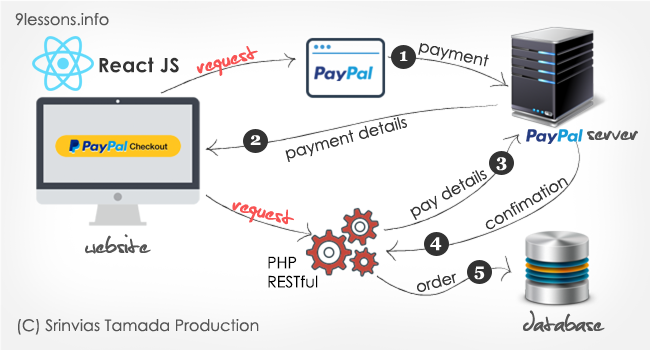 Component that display the user payment orders. Getting product details for products table. If you want you can extend to add pagination. User order details based on the post input uid. Getting individual product details based on product id. Creating order for successful payments. This will call internal CURL actions function paypalCheck. Using CURL methods authenticating PayPal transcation for more understanding check PayPal Express Checkout with PHP and MySQL. Insert order details with payment details. Using thie method cross checking the payment is preset are not. Are you using webpack for reactjs ? Nice article got more information about this thanks a lot! Really great and useful Post with working code. Nice article about paypal.Thanks for sharing this type of article.Keep it up. Thanks again.